A U.S. guild has reported the world first kill of Arthas Menethil, otherwise known as the Lich King of World of Warcraft's latest expansion. The last wing of the final raid encounter of Wrath of The Lich King opened up only yesterday for World of Warcraft players. One day was all it took for the world's top guilds to rip through the content and kill the Lich King on the easiest level, normal 10-man. 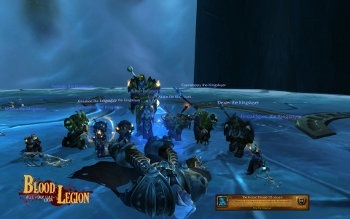 The trophy for world first kill goes to Blood Legion, a Horde guild on the U.S. Illidan server. The European guild, Ensidia (Tarren Mill - EU), routinely gets world first kills such as the bosses of Ulduar in WoW patch 3.2, Algalon and Yogg-Saron. Blood Legion beat Ensidia this time, however, by six hours. U.S.A! U.S.A! Now that the content of the third expansion for the massively popular MMOG is winding down, attention will now shift to what's in store for Cataclysm. The redesign of Azeroth will hopefully push the boundaries of what a perpetual world can accomplish with a worldwide event. Plus, introducing two new races will bump up subscription numbers surely, and players have been asking to play as goblins for a long time. I know that I can't wait to get my hands on a Worgen. And no, that's not a furry joke.